Standing at the crossroads of gospel and rock—armed with an electric guitar—is Sister Rosetta Tharpe (Rosetta Nubin), often referred to as "the godmother of rock and roll." 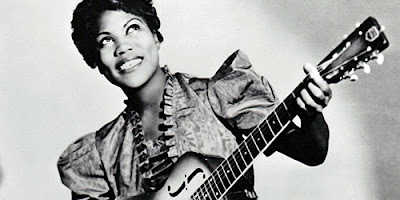 At one point before rock and roll came along, gospel music had no bigger star, and Tharpe's charisma, resonant voice, and instrumental chops contributed to her being heard both on the radio and eventually by white audiences. With her hits "This Train" and "Rock Me" in the 1930s, this spirited, well-dressed talent lit the pathway to both R&B and rock and roll. No surprise, but Tharpe stirred controversy by playing both spiritual and secular material; her stages included both churches and nightclubs. However, her sacred/"profane" artistry, which spanned gospel, jazz, blues R&B might best be seen now as bridge-building and eschewing labels — the unifying notion that, despite our differences, we're all on this train together. In 1944, Tharpe recorded "Down by the Riverside," which was selected for the National Recording Registry of the U.S. Library of Congress in 2004. Also, her 1944 collaboration with boogie-woogie piano man Sammy Price yielded what is considered as a clear antecedent of rock and roll, "Strange Things Happening Every Day" (a Decca Records single). Sister Rosetta Tharpe, a brand new nominee to the Rock Hall for the Class of 2018, is a great example of an artist that might be put into the Rock Hall under the Early Influence category, but the "godmother of rock and roll" is certainly the perfect candidate to enter those hallowed halls on Lake Erie.